Featuring a sparkling pool with jacuzzi, well-equipped living spaces and four beautifully appointed bedrooms, Villa Onyx lends itself well to small travelling parties or two families looking to share a villa. 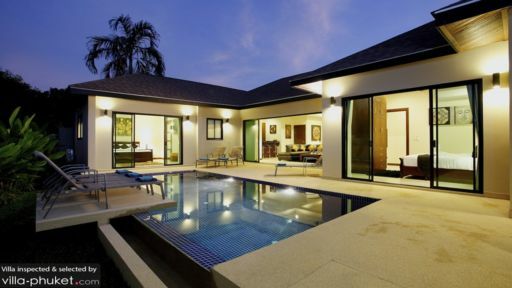 Villa vacationers will appreciate the home’s tasteful design, which features a mix of modern and traditional elements; the colour scheme contains rich hues of gold and black, and you’ll find Thai-style ornaments alongside contemporary furnishings. Nestled along the edge of an exclusive development, Villa Onyx offers an environment that feels serene and secluded - just perfect for holidaymakers seeking a restful getaway. 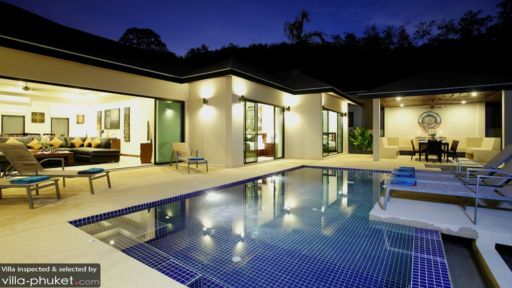 Four bedrooms comfortably accommodates eight guests at Villa Onyx. The master suite features a plush king bed, as well as a spacious en suite bathroom complete with a bathtub, shower alcove, vanity and toilet. Of the three guest bedrooms, one features twin singles and an en suite bathroom, while the remaining two bedrooms - one outfitted with a king bed, while the other is kitted out with twin singles - share a bathroom. The sun-drenched outdoor space at Villa Onyx contains a sparkling pool framed by recliners. An alfresco sala, equipped with an eight seater dining set offers the perfect setup for poolside dining. Get the barbecue pit fired up, put on a playlist and you’ll have everything you need for a delight poolside dinner party. Step past the glass sliding doors from the outdoor deck right into the villa’s beautifully appointed living area. The lounge features a plush leather sofa adorned with throw pillows, coffee table and a 50-inch flat screen TV with DVD player and cable TV. Just beside is the dining area with an eight seater dining set and an open kitchen with breakfast bar. Your stay at Villa Onyx comes complete with welcome drinks and housekeeping service. Amenities available at additional cost include a daily breakfast service, personal chef service and in-villa massages. The villa is also equipped with kid-friendly amenities, making it an ideal option for families travelling with young children. A baby cot, high chair and pool fence will be provided at request, while child minding services are available at additional cost. Villa Onyx is just two minutes’ drive (or a 15-minute walk) from Nai Harn Beach, a pristine white sand coast located in South Phuket. The beach boasts a lively atmosphere yet doesn’t get overly crowded, and is a great option for families and couples alike looking to spend the day by the sea. From Nai Harn Beach, you’re just a skip away from the beaches of Ya Nui and Ao Sane, both of which offer excellent snorkeling. Away from the beach, there’s plenty else to explore. The Big Buddha, Phuket’s landmark attraction is not to be missed. Its 45-metre Buddha statue is visible from afar, and breathtaking views out to Phang Nga Bay can be enjoyed from the viewing platforms located at the summit of the attraction. Art lovers will enjoy visiting the Phuket Art Village, an arts commune of home-studio-galleries. You’ll get to speak to the artists, or observe them as they work away on oil paintings, sculptures, performance art and music. The island’s only working distillery, Chalong Bay Rum Distillery is worth a visit. A 30-minute guided tour of the facility includes a tasting session, and lets visitors get a behind-the-scenes look into rum production. There’s also a cocktail workshop for visitors keen on learning the basics of mixing up their own drinks. Our favourite kid-friendly attractions include Rawai Park. It’s the largest kids club in Phuket, with wide-ranging facilities - from a water zone with slides and fountains, to a covered playzone and outdoor climbing tower - to cater to kids aged one to 14. Surf House Phuket, an artificial wave sport facility will be a great option for older children. You’ll enjoy easy access to a variety of dining spots, including cosy cafes, fine dining restaurants and seafront venues (these are located just five to 15 minutes’ drive from your villa). We love The Boathouse Restaurant for its prime beachside setting, Mom Tri’s Wok Pagoda for its impeccably executed Thai-Western fusion fare, Atsumi Raw Cafe for its range of raw vegan and raw vegetarian dishes and Coffee Tribe for its wide-ranging breakfast options. These venues are five to 15 minutes’ drive from your villa.